Just two hours north of Toronto, Muskoka is a quaint and charming region affectionately known as Canada’s cottage country. During the summer time, Muskoka makes the perfect local getaway from the city with picturesque lakes framed with a canopy of hemlocks, pines, and maples. It’s one of my favorite destinations for escaping the hectic city life, reconnecting with nature, and enjoying some of the more simpler things in life. If you were following my Instagram stories, you’ll know that last week I lucky enough to getaway on an SUV adventure with Ford. They gathered a bunch of us influencers for road trip out to Muskoka for a couple of days of adventuring in their newest SUV’s. I couldn’t have been any more excited to go! This trip combined some of my favourite things: road trips, adventure, nature, and great company. Our road trip adventure was a short and sweet 24 hours, but it was packed with lots of fun things to do and experience! After picking up our car, the Ford Edge, with my driving partners Rebecca and Micayla, we hit the open road and headed to our first stop, the Candy Shoppe in Orillia. Candy Shoppe was a candy shop like no other, the kind where all your childhood dreams come true! Located just off the highway, the Candy Shoppe has become a traditional pit stop on the way to and from cottage country. They had candy of every kind, including all the childhood favourites of long forgotten treats in unique and limited edition flavours, as well as a huge selection of collectibles. After satisfying our sweet tooth, we hopped back on the road and headed up to the beautiful Sherwood Inn Resort on Lake Joseph. Our home for the night was the Sherwood Inn Resort located on the majestic Lake Joseph. It’s an intimate resort in the heart of Muskoka nestled in a picturesque backdrop of old-growth trees, sparkling waters and in classic cottage style with an intimate feel. Sherwood Inn has a long and rich history as a Muskoka inn. Built in the style of an elegant New England country home, the main lodge building was originally constructed in 1939 and looks as wonderful today as it did when they originally built it. It’s the ideal place for both adventure and romance and it has everything you need for a getaway from great food, to gorgeous landscapes, plenty of activities like swimming, hiking, boating, and a number of trails to explore. I loved the historic charm of the resort and the grounds were so picturesque I could spend hours just admiring the natural surroundings. Growing up in beautiful British Columbia, the greenery and nature was a return to my roots and made me feel completely home. My room was comfortable and spacious, with a luxurious bath and shower, living area, fireplace, and to top it off it opened up to a large open outdoor deck space with overlooking the beautiful waters of the lake. After arriving at the resort, we had some time to check in and unpack before meeting up with the group again to learn a little more about Ford family of SUVs including the Flex, Edge, Escape and Explorer, and the brand new Ecosport and Expedition (both coming soon). In the last few years SUVs have been growing in popularity and so much so that they’ve over taken sedans. These days, SUVs doing it better in almost every way: comfort, safety, size and versatility – so it’s no wonder that so many people like them so much! Even fuel economy is now quite comparable and even on par to most sedans. The Ford family of CUVs & SUVs come in 4 (and soon to be 6) different models, so that there’s one that’s a perfect fit for you and your needs. 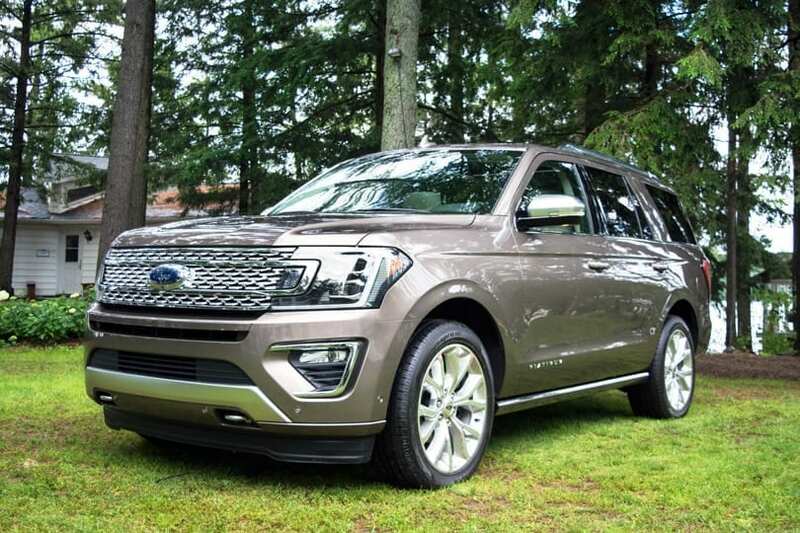 Each group of influencers drove a different Ford SUV’s up to the Muskoka and then we all had a chance to drive a different car back, and to explore around the surrounding areas, so we were able to experience each one of the different Ford SUV models. Being a downtown city dweller, my favorite Ford SUV vehicle is the Escape. It’s a compact SUV with plenty of room for bags and storage while still remaining a reasonable size, which makes parking in downtown Toronto not impossible. I love its with sporty handling, which makes it uber fun to drive while still being a comfortable ride. This wasn’t my first experience with the Escape and I had to a chance to drive it on my last Ford adventure as well, and you can see a highlight of my favorite features on it here. In the recent years, I’ve found that Ford have really stepped up their game. Their vehicles are now equipped with more features than you’ll often find luxury vehicles. Their navigation system and main console is probably one of the best around. I love how easy it is to use and intuitive, and their Park Assist still blows my mind! Another feature which I love and find very useful, is the Blind Spot feature. This feature gives your a visual light indicator in your side view mirror if there’s a vehicle in your blind spot. This is especially helpful when driving SUVs! You never know who’s lurking in your blind spot, so this feature can potentially save you from some bad accidents. Below is a picture of me from my last Ford adventure with my favorite Ford, the Escape! Next up on our itinerary, we had a photography lesson with renown wildlife & adventure photographer Michelle Valberg. She’s been telling stories with her camera for more than 30 years, and has travelled around the world from Africa to the Caribbean in search of adventure, and is particularly celebrated for her wildlife photography in Canada and in the Arctic. As influencers, photography is such important skill to master because it helps us tell a story with our images. In our photography lesson, Michelle taught all the in’s and out’s of photography including composition, lighting, and capturing rare moments. It was so inspiring to hear talk about the story behind a photo, and how it was captured, and how the combination of nature, light and composition come together to create that perfect shot. After our lesson, we had some free time to visit the surrounding areas, but I chose to stay behind and to hang out with Michelle and do some shooting on the Sherwood Inn Resort grounds. It was so amazing to hear her talk about photography so passionately and learn how she’s built a life doing what she loves as an entrepreneur. I had some time to put my newly learned photography skills to the test, here are a few of the nature photos I took. The pictures in this post that you see me in are taken by Michelle herself! The evening consisted of a beautiful dinner buffet with cocktails and wine at the in-house restaurant. It’s was a great time to connect with the other influencers and share our experiences of the day. We were also suppose to have an Astronomer star-gazing expedition with Jamie Giardini, and a night time photography lesson with Michelle, but unfortunately the weather kept us indoors. We all had fun regardless, chatting over drinks and trading stories while making s’mores. The next morning, we wrapped everything up with a delicious breakfast and some more free time to spend enjoying the resort. After saying a sad goodbye to our adventure family we set off on our way back to the city. on this on this amazing Ford SUV road trip adventure! That lake looks so beautiful and relaxing…there are so many hidden treasures all over North America. There’s so many places that I want to get to in this country alone. This country has such beauty and I don’t think people realize how many beautiful places there are. That car looks awesome! I know my husband wants an SUV sometime down the road again in this one might be a great one to try out. This looks like such a fun adventure! I would love to take a road trip with my girl friends. I am also a Ford owner (truck and SUV) and I love Ford. We’re slowly starting to look because we are thinking of expanding our family, both with pets and kids. My first car ever was a Ford. Gosh, I loved it. I am ALMOST in the market for a new car and I would love to purchase an SUV. Your trip looks so lovely and relaxing! I have been to Muskoka a few times and it so beautiful there. I will have to check out the Sherwood Inn for the next time we go. I would love to go on a road trip in a Ford SUV. I use to have a Ford Edge and absolutely loved it. I’d love to get another SUV soon. That looks like a fun trip! We own a very small car but often rent SUVs for trips. We just recently rented an Escape and loved it. Ford makes a great line of SUVs. These new Fords are awesome! I did a test drive of a Ford Edge and I loved it too. it is so beautiful there. Nice! I would like to have a car like this one, in a shiny black or smoke silver colour. Muskoka looks gorgeous! I love the country style of the Sherwood Inn, and how cool that you got a photography lesson from a professional nature photographer! We are thinking about getting an Explorer whenever my Highlander gives out. They all look beautiful. That does sound like quite the adventure! I would have loved the photography class. I do like that SUV, too! What a beautiful resort. I love it and that Ford SUV is super posh! I go to Muskoka most years and my daughter does camp there. It is a beautiful area. The drive can be a beast though from here. It is important to have a great car with great tires and a serious reason to visit. Photography lesson sounds like a good reason too. What a beautiful area! That explorer is gorgeous! I need a new car here soon, I am going to look into these! What an amazing car! I would love to drive something like this one day. It would be perfect for us as a family who go on a lot of road trips. I love my Ford car but didn’t know they also made SUVs but maybe because they are not that popular in my part of the UK.